In addition to analysing those who perpetrated the cyberbullying, the aforementioned 2010 study also looked at those who were being bullied. The traits that they found most frequently in cybervictims include having the appearance of certain behavioural difficulties (such as hyperactivity or trouble paying attention), suffering from emotional issues, and having peer problems. The study also found that teens who were “living in a family with other than 2 biological parents” were also cyberbullied at a higher rate. 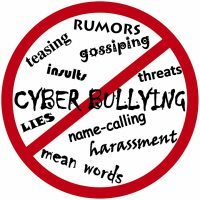 Studies have also found that adolescents who are cyberbullied have a greater risk of being personally bullied while at school. For instance, in 2016, the CRC surveyed 4,503 teens between the ages of 12 and 17. After analysing their responses, they discovered that 83 percent of those cyberbullied within the previous month had also been bullied at school. This correlation was confirmed by those who perform the bullying, with 69 percent admitting that they bullied their victims both places.